There’s this persistent notion that we use a mere 10 percent of our brains at any given moment. If only we could tap into more of the magnificent, squishy machine in our heads, we’d become quicker, cleverer versions of ourselves. It’d be a lovely idea if it wasn’t a crock of crap. Although the ten percent notion has been debunked ad nauseum by neuroscientists, its recurrent appearance in pop culture (most recently in the film Lucy) shows that this particular misconception is very much alive and kicking. Now, a team of MIT researchers has put yet another nail in the myth’s proverbial coffin. Their study, published yesterday in Science, shows how our brains fire up in many different cortical regions—ones that were thought to be reserved for separate functions—when we’re performing simple cognitive tasks. “Such a wide distribution of information is incompatible with the notion that we only use a small fraction of our brains,” study co-author Earl Miller, a professor in MIT’s Department of Brain and Cognitive science, said in a press release. 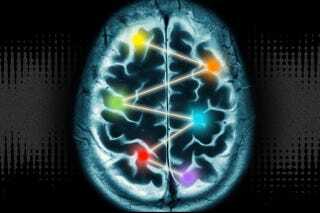 The longstanding view that the human brain is divided into sections coding for discrete processes (for instance, vision processing at the back, decision making toward the front) comes in part from fMRI studies that measure blood flow in the brain. But such tests, while useful for identifying changes in blood flow patterns when a subject switches between different cognitive tasks, don’t always reveal overall patterns across the entire brain. This image shows the new study’s results for the dynamic interplay of the sensory, task, and cue information in the brain’s cortex. “They’re showing you the tip of the iceberg sticking above the water, when actually, below the water, there’s a lot of processing going on everywhere,” Miller says. In their new study, the researchers built an array of 108 electrodes to measure neural spikes across nearly 2,700 cortical regions in six different functional “compartments” of the brain. Subjects were shown groups of colored dots moving either up or down, along with a gray shape that indicated whether they were to pay attention to color or motion. Afterwards, they were asked to identify the color or motion they saw with a series of eye movements. The researchers discovered widespread neural activity across subjects’ brains throughout the exercise. However, depending on the particular step in the sensory-motor pathway (identifying the cue, deciding to pay attention to color or motion, executing eye movements), brain activity would start in different regions and flow around in a novel sequence. Which is to say, while our brains certainly execute thought through many different pathways, sometimes leaning more heavily on certain regions than others, when we’re thinking, we’re using em’ a lot. Sorry, Morgan Freeman! You’re a wonderful actor, but I think we better leave the neuroscience to the experts.